The area bounded in blue on the map shows the area covered by flood alerts and warnings for Rainford Brook at Rainford South. Areas at risk include land and property at Berrington Road Cottage, between Grey House Farm and the river, Windle Park Wood, and some properties on Woodside and Birch Tree Avenues. 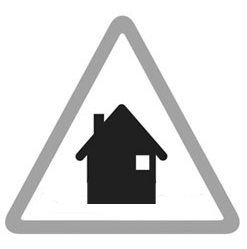 Areas at risk include land and properties at Siding lane, Lords Fold and Lower Shades. Also at risk, are some properties on Beech Gardens. Areas at risk include properties on Washbrook Close and some properties on Millbrook Lane, Wokefield Way, Cranston Close and Kiln Lane. Also at risk are properties on Dodd avenue, Percival Way, and the recreation ground. Areas at risk include land and property adjacent to Windle Brook between the allotments and Dilloway Street. This includes Percival way, Ruskin Drive, Coleridge Way, and Rivington Road .